Thembi's AIDS Diary More than 5 million South Africans live with AIDS. Thembi Ngubane was 16 when she was diagnosed. She talks about living with AIDS and how she works to keep the disease from destroying her spirit. More than 5 million South Africans live with AIDS. Thembi Ngubane was 16 when she was diagnosed. She talks about living with AIDS and how she works to keep the disease from destroying her spirit. Joe Richman, poducer of Thembi's story and producer of "Radio Diaries"
Thembi Ngubane recording her audio diary in Khayelitsha township, outside Cape Town. 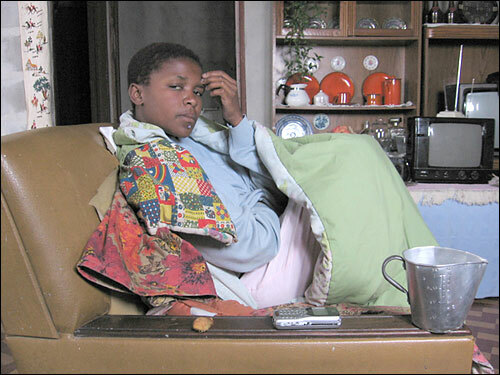 Ngubane recovering from an illness at her grandmother's house. In an interview punctuated by much laughter and some quiet moments, Thembi Ngubane explains why she decided to participate in the project — and what she's been up to since it concluded. Ngubane receives anti-retroviral drugs to treat her AIDS. But others are not as lucky. Even as the South African government has improved programs to provide crucial drugs, accessibility still is patchy across the country. To download, PC users right-click and select "save target as." Mac users control-click and "save (or download) link as." Thembi Ngubane lives in one of South Africa's largest townships, a sprawling sea of houses and shacks made of wood planks, tar paper and sheets of tin. She has a boyfriend and a close relationship with her mother and father. She is also living with AIDS. 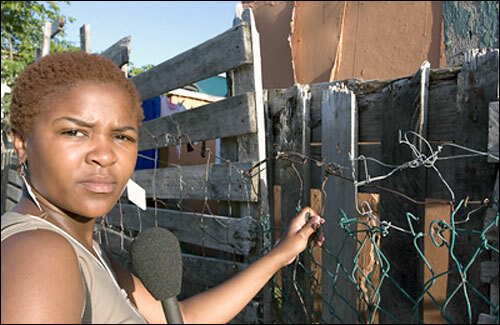 Ngubane was 19 when she first met radio producer Joe Richman in Khayelitsha, outside Cape Town. She was among a group of South African teenagers he interviewed about AIDS in 2004. He gave her a tape recorder, and for a year, she recorded an intimate audio diary that brings listeners into her home, among her family, to witness her daily struggles and triumphs. Ngubane introduces listeners to her boyfriend, Melikhaya — and recalls when she told him she was HIV-positive: "I thought, 'What if I've also infected him? Now I've ruined my life, and I've ruined everybody's life.'" She chronicles how difficult it is to tell her father about her illness: "I've felt like I have disappointed you.... I thought that it was going to break you into pieces," she tells him. And occasionally, Ngubane's frustrations overcome her: "My mother, she clothed me, fed me, raised me, and now, at the end of the day, she must also bury me. I was supposed to be the one who was going to look after her.... That is not right." But throughout the diary, Ngubane expresses the desire she has to stop hiding her disease — and to help others stop hiding, too. About 5 million people are HIV-positive in South Africa, and young women aged 16-25 make up 75 percent of all new infections. Ngubane's audio diary collects the intimate moments and disparate episodes of her everyday life and crafts a larger story that tells the story of the disease and its impact. "Thembi's AIDS Diary" was produced by Joe Richman/Radio Diaries with help from Ben Shapiro, Deborah George, Anayansi Diaz-Cortes, Sue Johnson, Miyuki Jokiranta, Sean Cole, Britta Frahm, and Samantha Schongalla.